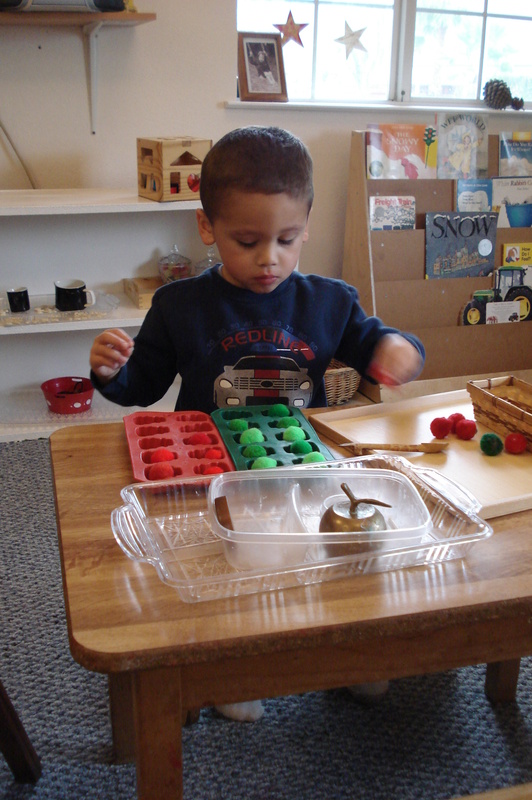 Montessori~ what’s it all about anyway? Is is real or pretend? There is a lot of information about Montessori Education on the internet. You can study the history of Maria Montessori, read about her ingenious and beautiful materials, even see YouTube videos of their presentations. I would like to tell you about my experience. Many years ago, I graduated from college with a degree in Psychology and a California Teaching Credential, with an emphasis in early childhood, and very little money in my pocket. So, I went looking for a job. I had already worked in several preschools and completed my student teaching, so I thought I knew what was going on. Teaching jobs were scarce at that time and, long story short, I was finally employed as an assistant in a Montessori Primary Classroom for 2-6 year olds. I soon found out that I really knew very little, about Montessori. When the children arrived and proceeded to get to work, I was absolutely amazed. Working alone, or in small groups, the children chose materials from the shelves and carried, sometimes precariously, the trays with their jobs to the little tables and proceeded to sit down and start to work. When finished, they put them back on the shelf . If there was a spill they cleaned it up with the cleaning materials waiting for them. Everything they needed was ready: drying cloths, sponges, hanging racks for the wet towels, and child sized brooms, tools, and utensils that were not toys but really were miniatures of those that adults use . Serving their own snack , they poured from small glass pitchers that fit their hands into breakable mugs, taking care of these items so as not to break them. They worked on their own projects, or with a friend. One child was diligently coloring a continent map of the world. Another was building with beautiful colored blocks and set up a pink tower from large to small. Another was matching pictures to letters. One child was pouring beans from one container to another, and still another counting beads in a chain carefully placed on a little mat. I felt like a giant in their world, and that is how it should feel. It was, as Dr. Montessori first called them, a “children’s house”. A Montessori Classroom, or Prepared Environment as we call it, is a child’s workplace, and they know this and they love it. It is their world. I was in awe just watching. I was in awe of how much they are capable of. And the quiet. They were actually concentrating, doing their jobs, using quiet voices like in a library. It was truly amazing and nothing like I had ever seen in the free-for-all, fun and noisy preschools I had worked in before. I heard words like “excuse me” between children. and “thank you”. I saw children starting and finishing a task on their own initiative. I liked it so much I invested in my Montessori Training, which is an intense year-long training, including making 5 thick albums of materials presentations, by hand, and a year of mentoring in a Montessori School. It was worth every minute. Twenty (plus) years later, in my own classroom I do admit that everyday is not as calm as that first impressive day, but on a good day, it truly is magic. There are moments when the teachers can look at each other in awe, and the classroom has a satisfied buzz, everyone busy, working at their own pace with the materials prepared and available for them to use- independently, and responsibly. The rest of their day they try to cope in the over sized adult world, but this place is just for them, with everything just their size. It is carefully prepared by the teacher with each child’s needs, challenges and strengths in mind. The bar is high, we expect them to clean up after themselves, be respectful to each other, and with the teachers and all living things, and to the materials. Respect is , to me, one of the most important aspects that sets Montessori Education apart. It is more than just learning how to wait a turn and to ask for help and not to interrupt. Every day lessons of common courtesies and manners, something that the world is really lacking these days if you ask me. Grace and courtesy is actually part of the curriculum, and it shows. I smile when I see the wall covered with class photos of all the children I have taught over the years. It’s not always easy, but as parents and teachers we do the best we can for our children. It is my hope that the lessons we teach in Montessori Preschool will be with them for a lifetime, and hopefully make the world a better place, one child at a time.